Jancon Exteriors also offers new door installation in Franklin and surrounding areas with the best in materials from Therma-Tru Doors. From Steel Entrance doors to Fiberglass entrance doors, storm doors, or doors with decorative glass, we have access to many different styles and types of doors. With a front door by Therma-Tru, not only will you see an increase in comfort, energy efficiency and performance, you will also see an increase in curb appeal. Their fiberglass and steel entry doors will add beauty and security to your home. In fact, door replacement in Walpole and Franklin can increase the perceived value of your home by more than $24,000… just by adding a Thema-Tru entry door system! When a retired Owens Corning executive, David Welles, purchased a bankrupt building supply company in Toledo, Ohio in 1962, Therma-Tru Doors was born. Then, in 1982, the company launched its Fiber-Classic style, the first fiberglass door on the market. 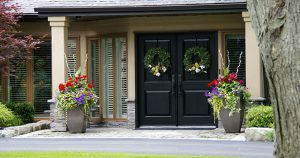 And, 25 years ago, Therma-Tru introduced a bold innovation to the home-building market: an entryway door that looked as beautiful as wood, but performed with the durability of steel. Revolutionizing the industry is what you can expect from the nation’s leading manufacturer and most preferred brand of fiberglass and steel exterior door systems… Therma-Tru. Why Choose Therma-Tru Fiberglass Doors? Thermal-Tru is the market leader and innovator in fiberglass door technology. Their fiberglass doors are more durable and energy-efficient than wood or steel doors, and are backed by the best full-system warranties in the industry. After 25 years, fiberglass still remains the most advanced material for entryway-door replacement in Walpole, Mansfield, and surrounding areas. They satisfy both today’s and tomorrow’s homeowners by giving them the look of wood doors and the strength of steel doors, without the compromises of either. Fiberglass doors actually offer the optimum combination of security, energy efficiency, performance and aesthetics. Unlike wood doors, fiberglass won’t dent, crack, split or splinter. Also, fiberglass won’t rust or warp like steel doors can. It resists shrinking and swelling with temperature changes, allowing the finish to last three times longer than on a wood door. And, the solid polyurethane foam core offers five times greater insulation value than wood doors. When you buy any Therma-Tru full system entry or patio door from Jancon Exteriors, you’ll get the full benefits of their warranties. We know that you’ll love our guarantee to protect your investment as much as you love the great style, easy installation, and durability of your new Therma-Tru Door. If you’re looking for door replacement in Walpole, Franklin, Mansfield, or Medway, give us a call. We would be honored to speak with you.